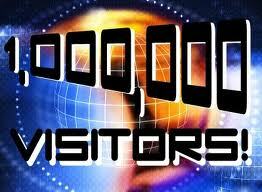 Three and a quarter years and over 900 blog posts later, SG PropTalk has finally hit the one- million visitors mark. Although the number is small change compared to say, sgCarMart, which reportedly gets over 6.3 million hits a day, the wife and I are rather thrilled by this little milestone that we have archieved. Without sounding cliched, we are really thankful for the support and participation from our readers since the inception of SG PropTalk. It may take us another 3 years (assuming we make it that far) but the wife and I are eagerly looking forward to the "birth" of our 2,000,000th visitor! 1 comment to ''A million thanks!"